Welcome to another game day here at spalanz.com! 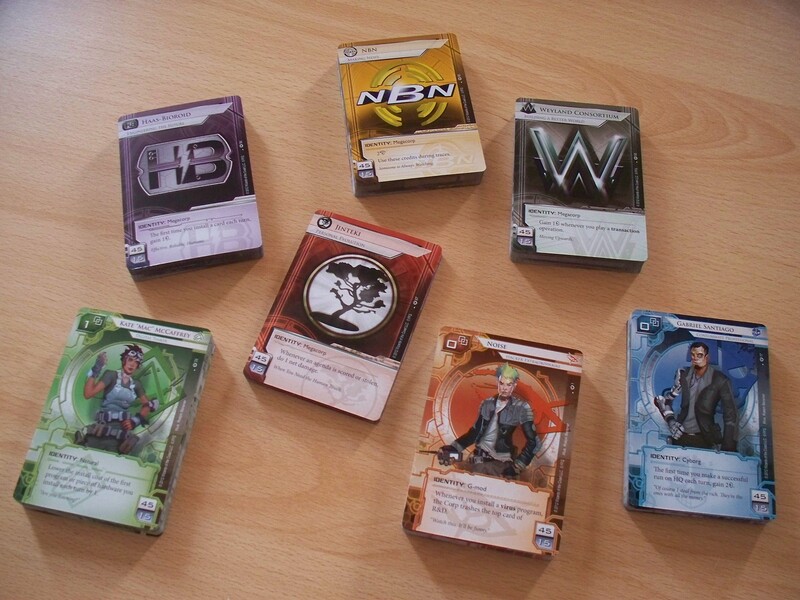 Today is fairly interesting, if you’re a fan of card games, as I’m taking a look at another of the LCGs from Fantasy Flight Games: it’s the turn of Android Netrunner! This was the, what, fifth LCG released from FFG, a spectacular game that really exploded onto the scene at GenCon 2012 and, from what I’ve seen, hasn’t really lost that momentum. It’s a game based on the Netrunner game from the 90s, a game that was created by Richard Garfield (of Magic: the Gathering fame) and gained something that sounds like a cult following. It’s not a game I ever thought I’d be interested in, but it won me over about two years ago, and it’s definitely something that I enjoy playing. However, I wouldn’t call myself an expert, not by a long shot, so this blog is intended more as my assorted thoughts rather than anything particularly insightful! 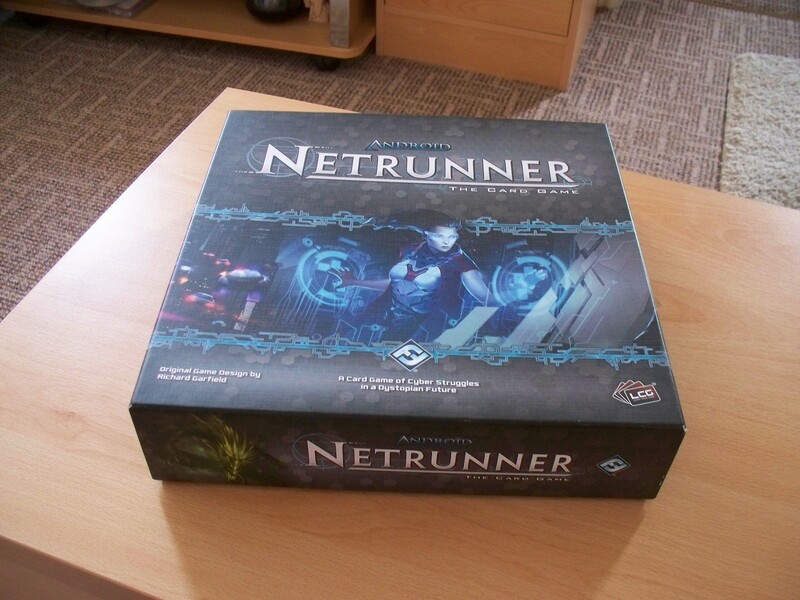 Android Netrunner is an asymmetrical game for two players, where one person takes the role of a Megacorp and the other plays the Runner, trying to hack into the corp’s servers looking for agenda points to steal. The corp, on the other hand, is trying to score these agenda points, and the first player to gain 7 points wins. The game really shines in how the theme is reflected in the mechanics. Rather than go through the game-play myself, I shall defer to the tutorial video from FFG, which does a far better job of things than I ever could! As I said, it’s a game that won me over, primarily because of the theme that comes through here. I’ve not been able to play it that often, sadly, and in fact the last time I played it is getting on for a year ago. Shocking! First of all, I really love the corp mechanics. Even though I’ve never actually played the corp, I love seeing the strategy evolve of putting down Agendas – or bluffing with Upgrades or Assets – and protecting the whole lot with Ice, which the Runner then has to try and assess where best to run at. I play Shaper most often, because I love the whole ethos behind the faction and all that. 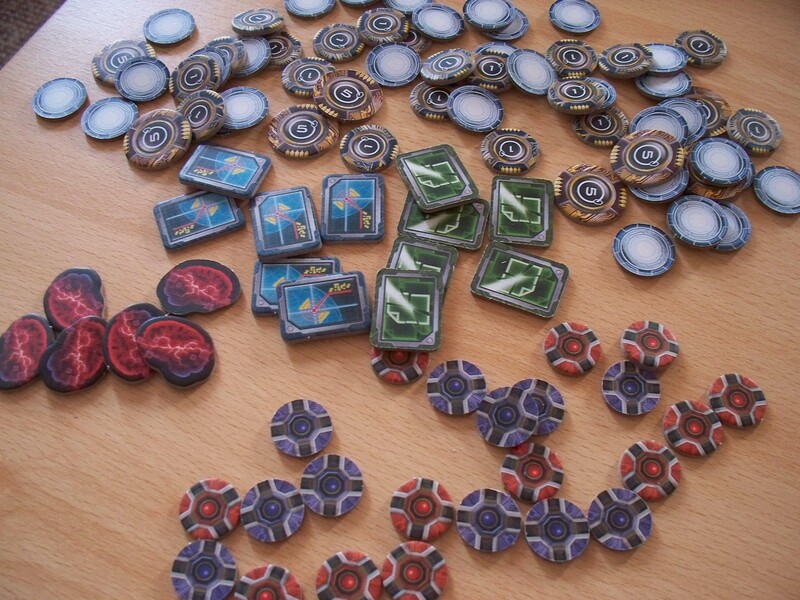 Not that they’re a goodie-type of thing, but it’s just the whole idea of modding their deck, trying to make some really cool stuff out of what they have, and it’s a much more interesting way to play. The Criminal faction has its moments, but the whole thing about snagging credits lends itself more to a support faction to me, while the Anarch thing has always been really annoying for me to make it work. Anyhow! Something that I found a bit confusing for a long time – and even now, because I don’t play it all that often – is the terminology employed. I play a lot of card games, if you haven’t noticed already, but because this game refers to everything by different terms, even the rulebook can be a bit difficult to follow at times. For instance, when playing the Runner, you don’t have a deck, a hand and a discard pile; you have a stack, a grip and a heap, respectively. Furthermore, the Corp has R&D, HQ and Archives! Play areas are called the Rig (for the Runner) and Servers (for the Corp), too. While these things do help with the theme immersion, I still get a bit confused and, consequently, frustrated when playing this, as cards will reference stuff that I need to stop the game to look up what it means. There is a lot of strategy involved in the game, a lot of which I must admit goes over my head. I’m not the most strategic of players, especially in games like this where there’s too great a chance that what I’m building towards will just be destroyed. For instance, a common Runner strategy is to wait until you get a full rig of icebreakers installed before you run, whereas I tend to go for the more effective strategy of just running as much as possible, even if I don’t have the credits to buff icebreakers, or if I haven’t even got any icebreakers out. The corp needs money to rez cards, so if you can drain those resources then go for it! Something else I like about the Shaper faction, however, is the ability to merge icebreakers, almost. 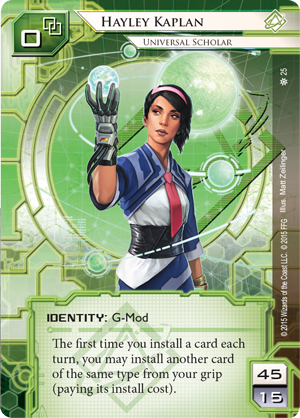 So you can get your ‘breaks code gate subroutine’ icebreakers, but there are cards you can play that give the ice you’re running against the code gate type, which is really useful. Or the Alpha and Omega icebreakers, which just break ice subroutines, no matter what their type. Wonderful stuff! It’s unusual for me that I actually really enjoy the deckbuilding aspect of this game, almost as much as the game itself. 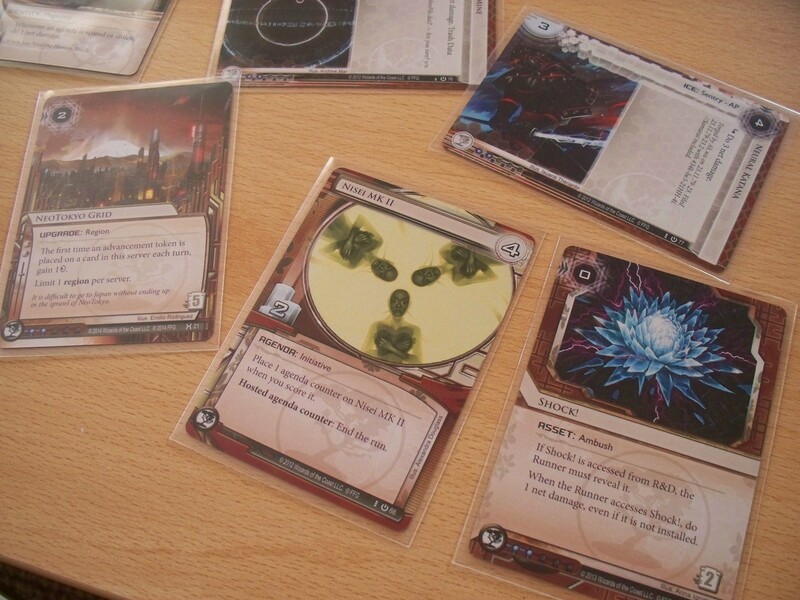 I play a lot of card games, as you may have gathered by now, and while I don’t particularly dislike the effort that goes into making a deck for games like Lord of the Rings or Call of Cthulhu, it’s definitely different for Netrunner, I have to say. It’s almost like there’s a level of artistry or somesuch that goes into putting together the perfect rig, and then seeing it all pull together (or, y’know, not…) And this is another aspect of why I like Shapers so much – while the other Runners feel like they concentrate more on tricks and altering the game to their own end, the Shapers are more focused on playing the actual game, and playing it perfectly, like a well-oiled machine. 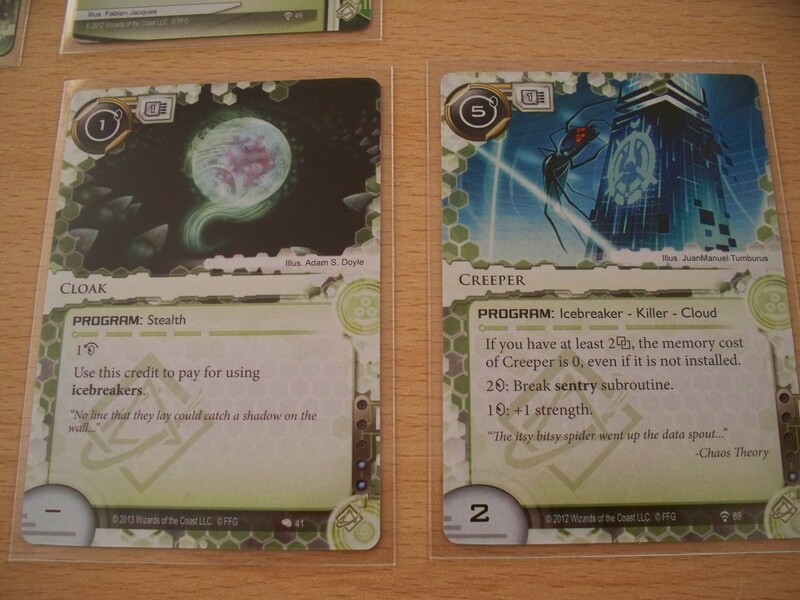 There’s an excellent article over on the FFG site, Get What You Want, When You Want It, which explores the Shaper faction in more detail – I can highly recommend it for a look! To date, there have been three full cycles of expansions, along with two deluxe expansions, the latter focusing on specific factions only. The cycles have been doing some interesting things, I must admit. I find it quite intriguing, actually, that the game was initially designed with three supporting cycles. 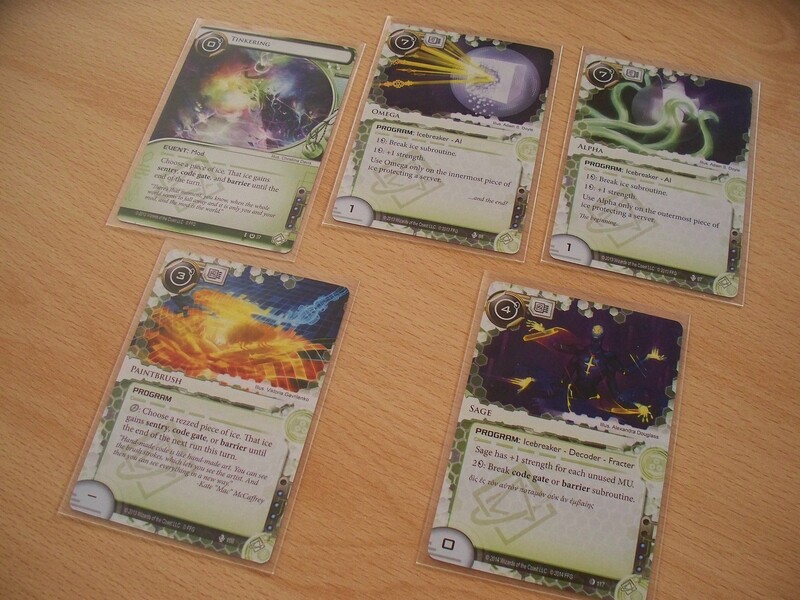 The first cycle – Genesis – gives each faction a new identity, while adding more cards that strengthen the base game, while the second cycle – Spin – starts to explore specific tactics, such as bad publicity for the Corp, and introduces the ‘double’ event, cards that have really useful abilities but have two distinct costs, such as the credits cost and a click. 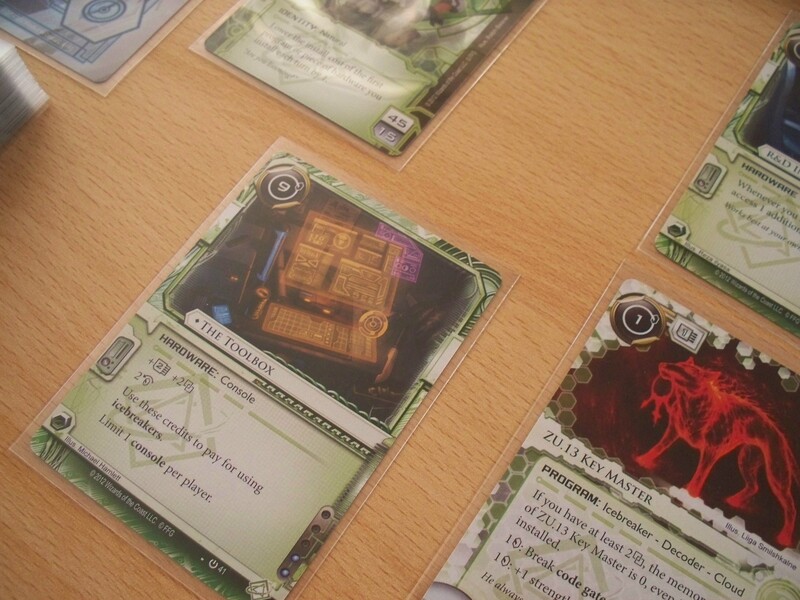 The third – Lunar – cycle brings more new identities along with more tactics that the designers specifically tried to mess with the established game meta. Previous Previous post: New stuff! And not-so new stuff! Next Next post: Here be Monsters!